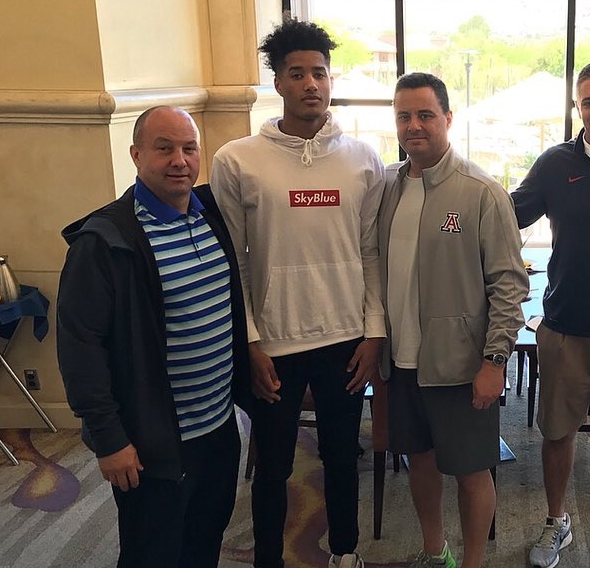 We spoke with Arizona's latest commit Omar Thielemans & asked him questions Arizona fans/PPU members wanted us to ask. How long ago did Arizona coach Sean Miller first start recruiting you? Omar: I would say 1 month ago. When did you first hear about the Arizona Wildcats growing up in Belgium? Omar: I know arizona for a long time, it’s normal as a basketball player it’s like Duke everybody knows Duke and Arizona right? So I would say when I started playing ball, when I was 11. What did you think of Tucson & the Arizona campus? Did Miller talk to you about what what role you'll possibly play on the team your freshman year? Omar: Coach Miller said he needs a player like myself who can play multiple positions as a freshman and someone who can pass the ball and create his own shot as well. Did any other teams reach out to you or show interest? Omar: Stanford, UAB, Colorado St, Maine, & Drake all offered me a scholarship, but other teams showed a lot of interest like MTSU and Dayton. Arizona coach Sean Miller expects his players to play hard on the defensive end. Do you consider yourself a defensive stopper? Omar: Like people know, Europe is quite known for full court press and defensive effort, so I’m always ready to step it up on defense it will be a an adjustment now, because here everybody’s athletic you know. Who's your favorite Arizona player of all time? Omar: My Favorite player of all time, would have to be Stanley Johnson. When will you be moving to Tucson? Omar: I’m heading back for the summer 2 session which will be Around July. Last question. Are you ready to play in front of over 14,000 screaming fans in a sold out Mckale Center? Omar: Obviously the gym is crazy and all of that, and the fans are really passionate, so I think if your team is playing with a crowd who supports you like this and show you love, your confidence is only going up. Also, every basketball player should be able to shut off everything, and just focus and go to war between those 4 lines. Thank you for taking time out to answer questions with us. AWESOME! I like how you had members questions included in this Q&A. He seems like a down to earth, smart & humble dude. Beardown! Thanks for conducting the interview! To have only been recruited for a month, and then to commit to Arizona shows you he was willing to commit a lot sooner possibly. I'm just glad we got him and not someone else. Miller is going to have to continue to recruit the overseas prospects to find those hidden gems to keep Arizona relevant while we go through this FBI storm. Recruits like Markkanen/Thielemans are the type that keep us on top of the PAC-12 until these domestic prospects stop being so damn scared. Another questions I asked Omar after the Q&A was if he'd already signed his NLI. He said they're going to send it to him this week to sign.